The Merrimac Farm Chapter of the Virginia Master Naturalist program is based in Prince William, Virginia, and serves citizens living in Northern Virginia. The Prince William Conservation Alliance initiated the chapter and remains a key partner. Details on the training classes, volunteer projects, and social events are maintained on the chapter's own website. Participating with the Merrimac Farm Master Naturalists is a fun way to learn more about nature nearby, improve your community and meet new friends. Merrimac Farm Master Naturalists help monitor Bluebirds, plant trees, speak up for environmental protection, and more. We at the Merrimac Farm Chapter of Virginia's Master Naturalist Program appreciate the value of our forests, wetlands, streams and rivers, wildlife and wildflowers. We hope you will join us and take a closer look at Northern Virginia's cool critters and the places they live. The most important qualification for potential Master Naturalists is a desire to contribute to your local environment through volunteer service. Our goal is to support community stewardship. 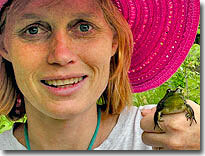 The process for becoming a certified Virginia Master Naturalist starts by with the basic training course. An additional eight hours of advanced training and 40 hours of volunteer service are required yearly.